On Friday, March 23, the Dow Jones Industrials (DJINDICES: ^DJI) finished a terrible week that saw the average lose more than 1,400 points. Many investors went into the weekend extremely nervous that a new downward phase of the recent market correction was under way. Yet by Monday morning, optimism had taken root again, and the Dow posted a triple-digit gain to start the new week. This phenomenon of extremely good days coming right after extremely bad days is a lot more common than you’d think. 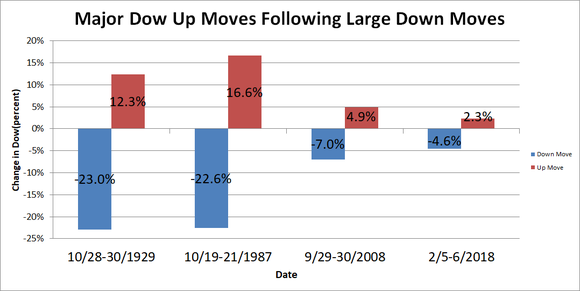 Take a look at some of the Dow’s yo-yo moves below. This chart makes it clear that the amount of volatility that we’ve seen lately is a lot lower on a percentage basis than most investors think. But that hasn’t made it easier to endure. In terms of sheer point totals, the moves this year have been dramatic. The Dow dropped a record 1,175 points on Feb. 5, only to regain 567 of those points on Feb. 6. Finally, it’s important to notice that knee-jerk bounces rarely pull back all of the Dow’s losses in one fell swoop. Over time, though, the market has always climbed back to new highs. That’s a track record that has frustrated those who sold after big declines — but that smart investors have taken advantage of time and time again to lock in long-term gains. * Stock Advisor returns as of March 5, 2018.